A unique Saskatchewan architectural firm has landed a position on a prestigious international project. Ray Gosselin Architect Limited, of Regina, is a member of the UNCEDED team, which was recently selected to represent Canada at the prestigious 2018 Venice Architecture Biennale in Venice, Italy this coming spring. The Venice Biennale has existed for more than 120 years and is touted as one of the most prestigious cultural institutions in the world, encompassing music, cinema, and theatre. Architectural exhibits were first incorporated into the festival in 1980. It is expected that more than 300,000 visitors will take in this 16th Venice Architecture Biennale between May and November of 2018. “It’s an incredible honour to be part of a team selected to represent Canada in this very important exhibition,” says Gosselin. The UNCEDED project involves a collaboration of 18 Indigenous architects and designers from across Canada and the United States, under the leadership of renowned architect, philosopher, and human rights activist Douglas Cardinal. It will explore Canada’s recent focus on reconciliation and the development of a new relationship between Indigenous and non-Indigenous Peoples. The 2018 Venice Biennale, which will feature Gosselin and the UNCEDED team’s work, is focused on the theme of Freespace, and is intended to “reveal the capacity of architecture to connect with history, time, place, and people”. It is under the direction of Grafton Architects of Ireland. “This is very important work,” says Gosselin, “because it helps to encourage the discussions going on, here and around the world, in relation to the building of new relationships between Indigenous and non-Indigenous Peoples”. Gosselin is one of just 16 registered Indigenous architects in all of Canada. He is of mixed ancestry—German, Métis, and First Nation—and is a member of Muscowpetung First Nation. He grew up near Estevan, took pre-architecture courses from the University of Saskatchewan, and then a Master of Architecture degree at Dalhousie University in Halifax. In 2016 he became the first Indigenous president of the Saskatchewan Association of Architecture. Now based out of the First Nations University in Regina, Gosselin works with a range of different clients, but continues to offers services targeted at Indigenous organizations. In his 29 years as an architect, Gosselin has worked on a variety of exciting projects including the redevelopment of the A.L. Cole plant in Saskatoon and the designing of the Husky Upgrader. He has also worked on both large and small projects including seniors’ residences, schools and more. He was fortunate to have worked under Douglas Cardinal on the National Museum of the American Indian in Washington, DC and the Museum of Civilization in Ottawa, and was project manager in the creation of the First Nations University on the University of Regina campus. “The First Nations University was a landmark project. There was a lot of planning to manage between the University and Wascana Centre Authority, and all of their partners, to agree on the location for the new building,” he says. 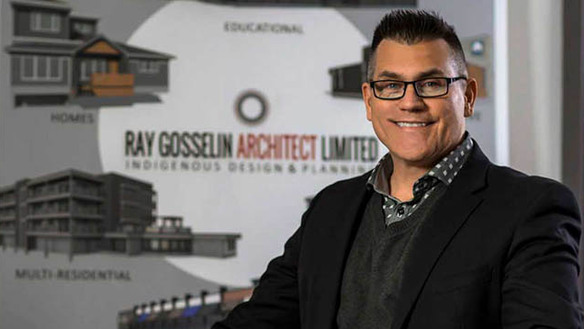 Since the launch of Ray Gosselin Architect Limited in 2014, Gosselin has been involved in designing all or parts of facilities such as credit unions, schools, car dealerships, housing developments, seniors’ homes and more. He is in the process of working on developing a governance facility for Touchwood Agency on the Muskowekwan First Nation, and is part of several collaborative groups renovating three Saskatchewan First Nations Schools. His firm specializes in healthy planning and design. “Healthy planning and design is a synthesis of health and wellness with the built environment. Evidence suggests the built environment has a profound effect on personal and collective health,” Gosselin says.